Exactly at this time a year ago, I spent a few days near Edinburgh, Scotland. I didn’t have time to do a lot of sightseeing, but still managed to get around a bit and take in some beautiful views of the city. There is, first and foremost, Edinburgh Castle, sitting in the middle of Edinburgh on a hill. You have a nice view of the city and beyond from up there. Of course it was packed with tourists, so I didn’t go in – but the ice cream sold at the truck on the square in front of the castle was super tasty. Since I also like to go off the beaten path a bit, I took a bus to Inverleith and walked to Inverleith Park. It is a place where people play all kinds of sports, or walk their dogs, or have fun with their kids. Plus, you have a nice view of the city as well. I would have loved to visit the Royal Yacht Britannia – but didn’t make it in time for the last admission. So check their opening hours if you want to go aboard. Driving west along the waterfront towards Hopetoun House, you get a nice view of the spectacular Forth Bridge, an iconic suspension bridge. Hopetoun House itself is quite impressive, but a really neat place to have tea and delicious cake is The Stables Kitchen, a tea room and restaurant in, you guessed it, the former stables of the 17th century mansion. I had a great time in and around Edinburgh – and I most certainly will come back, hopefully with more time to explore everything – and have more tea. It’s the time of the year when people have something special in mind when they visit Washington, D.C.: the cherry blossoms. In 1912, the Mayor of Tokyo gave the US about 3,000 cherry trees – after the first batch of about 2,000 trees from Japan turned out to be infested with insects. The trees were planted around the Tidal Basin and are blooming every spring. It was writer and National Geographic legacy Eliza Scidmore who originally had the idea of planing the cherry trees in the new park that was built at the end of the 19th century, to the West and the South of the Washington Monument. She couldn’t quite convince the men in charge to add the cherry trees – but then, two decades later, she pitched her idea to Helen “Nellie” Taft, wife of then-president Howard Taft. And together, they laid the groundwork to what is today a most stunning display of beauty every spring. It took me a couple of years when I was living in the area, to actually visit the trees in full bloom. They present their beauty only for a short period of time, and, of course, everybody wants to see them. So expect there to be crowds. To avoid too many people blocking you view, go in the early morning hours, right after sunrise. You still won’t be the only one, but at least you might find a parking spot at Haines Point and can walk along the Potomac and marvel at the trees. Here is a map where to find the cherry trees, and here is the prediction of when the cherry blossoms will be at their peak. Apperently, this year the prediction is April 1-5 or 3-6, depending on whom you trust. But you might just want to go a fews days before that, during the week, to avoid the really big crowds. Or, you don’t mind the masses and visit the National Cherry Blossom Festival. The Spanish moss was my favorite in Savannah, Georgia. You can see it hanging from the trees in Forsyth Park (pictured above), but also, most beautifully, at Wormsloe Historic Site. Not far from Savannah, this is the place where the first settlers arrived from England in 1733. A “Spanish Moss Avenue” is leading to the ruins and a little museum, where you can learn more about life in the 18th century. I only spent two nights in Savannah back in April 2016, but really loved the place, having never been to Georgia before. Equally impressive is the Savannah River, and the big container ships going upstream or downstream, sometimes being steered by (comparatively) tiny but powerful tug boats. I took a little tour on the river on the Savannah River Queen, a paddle-wheel riverboat. I enjoyed the different view of Savannah’s historic riverfront, and the scenery along the river. And, since I absolutely love lighthouses, I stopped by at the Tybee Lighthouse on Tybee Island. Then it was time to get back to the hotel at the waterfront. A short, but memorable trip. On a must-see-list of the US is, of course, Mount Rushmore – the “majestic figures of George Washington, Thomas Jefferson, Theodore Roosevelt and Abraham Lincoln” carved in a mountain. It is definitely worth a visit, but there is much more to see in the “Mount Rushmore State” South Dakota I realized when explored the area in 2013. Another impressive mountain is the Crazy Horse Moutain, where in 1947 Chief Henry Standing Bear and sculptor Korczak Ziolkowski started an undertaking that is still going on today: Carving the likeness of the Lakota Leader Crazy Horse into a mountain. You can take a tour close to the mountain, and I would also recommend attending the Legends in Lights laser show in the evening (from Memorial Day through September). It is quite the spectacle, when the mountain becomes a giant screen for a laser show. And then there are, of course, the Badlands , a spectacular mountain range you can explore hiking. If you need a place to stay, and are ok with something really basic – but clean an with the friendliest owners, how about the Badlands Budget Host Motel in the tiny town of Interior, right at the entrance of the national park, with a population of 67. You realize how much comfort you are used to these days when visiting the Prairie Homestead, the home of the early settlers. And in case you were wondering how a prairie dog looks like, here is one. If you want to see buffalos, however, make sure to be in South Dakota for the Buffalo Roundup in Custer State Park. It is interesting to see all the buffalos rounded up together, to be counted and checked out. An exhibtion of a completely diffent kind is the South Dakota Air and Space Museum, where you can check out different planes and can sit in a cockpit of a F-106 fighter jet. They even have an original “Rosinenbomber” (Candy Bomber) used in the Berlin Airlift 1948/49, when the Western Allied Forces supported Berlin – cut off from West Germany by the Soviets – through the air. The billboard mentions Col UASF ret. Gail Halvorsen, who dropped candy bars with tiny parachutes off his plane for the kids in Berlin – hence the name “Candy Bomber”. I had the pleasure and honor to meet Col Halvorsen at the 60th anniversary of the Berlin Airlift at Andrews Air Force Base, Md., in 2008. What else is there to see and do in South Dakota? Dinosaurs – at Dinosaur Park in Rapid City. The Black Hills with its waterfalls and scenic roads. If you feel romantic, spend the night at the Spearfish Canyon Lodge. And don’t forget to stop at the “famous” Wall Drug Store, 55 miles east of Rapid City. You will see the billboards when you are still miles away. It is, well, made for tourists. But you can get free ice water, just like in the old days. I’ve already written a post about the Minute Man Missile Site. And if you feel really adventurous yourself, spend a few hours in the Aerial Adventure Park. 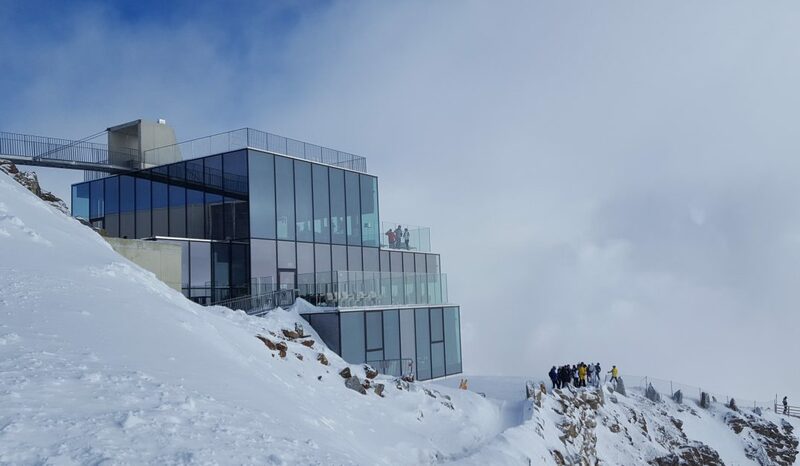 Entrance to the ice Q restaurant and the James Bond installation on top of the Gaislachkogl mountain. It’s all there: the Bonds, the villains, the girls, the locations, the weapons, and the gadgets. 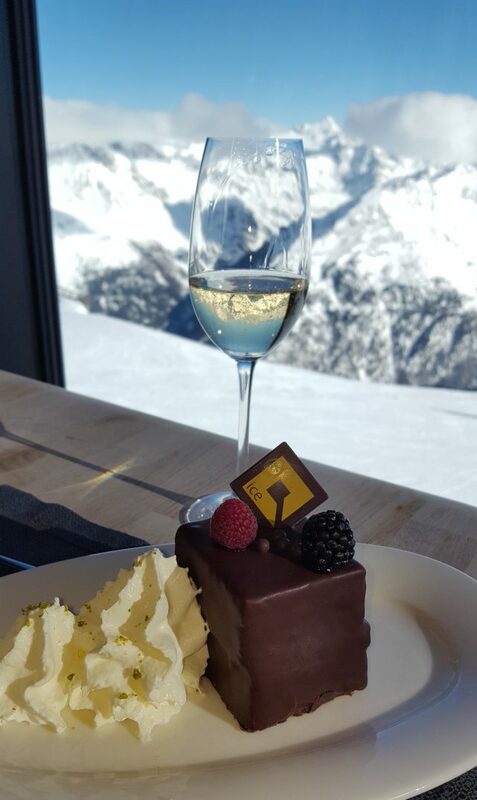 And “007 Elements” on top of the Gaislachkogl mountain in Sölden, Austria, is called “cinematic installation” for a reason. 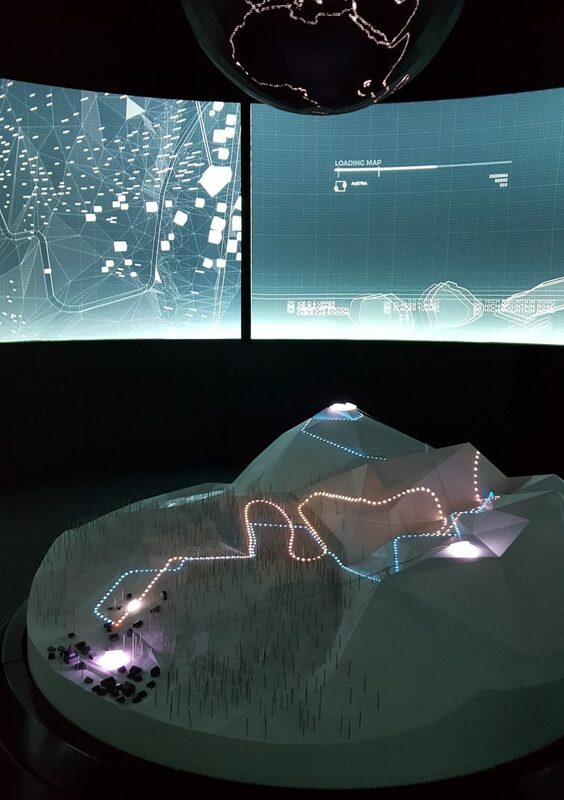 It is not just an exhibition, it’s a 360-all-senses-experience, 3000 m (about 10.000 ft) above sea level. Literally built into the mountain and opened only last summer, even the entrance is dramatic: You are walking through the “barrrel of a gun”, a reminiscence of the iconic opening scene of every Bond movie in general, and of 2015’s Spectre ,in particular. 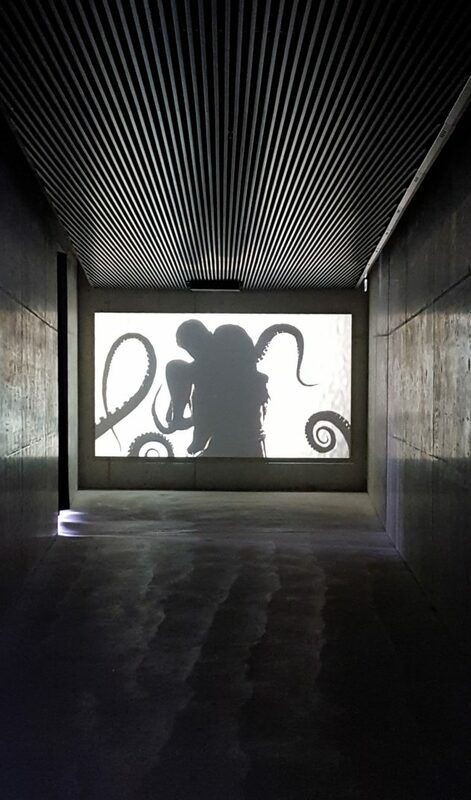 From there, you walk onto a large balcony with a spectacular view (don’t go on a day when it’s too cloudy, the scenery is part of the installation). Walk through the “Lobby”, where you get a brief introduction, into the “Lair”. 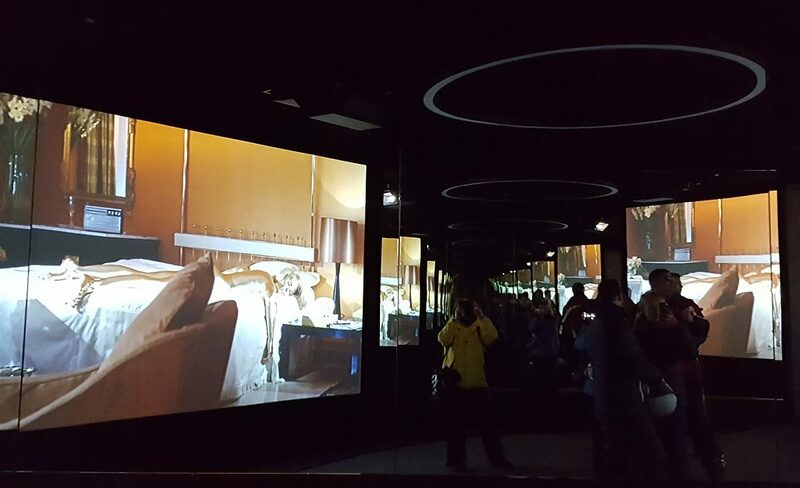 The “Lair” is a 360-hall of mirrors, where you experience many of the famous scenes from the Bond movies throughout the decades. 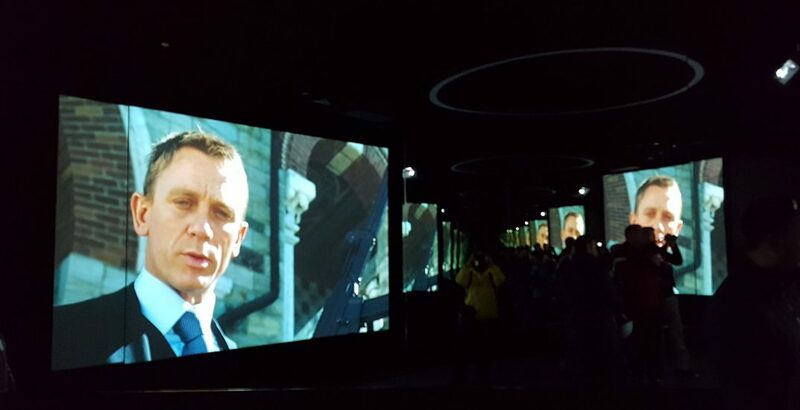 Inside the “Lair” – a hall of mirrors with larger than life projections of many of your favorite Bond scenes. Proceed to the “Briefing Room” – and “Miss Moneypenny” Naomie Harris introduces you to the many exotic locations of the 007-movies. 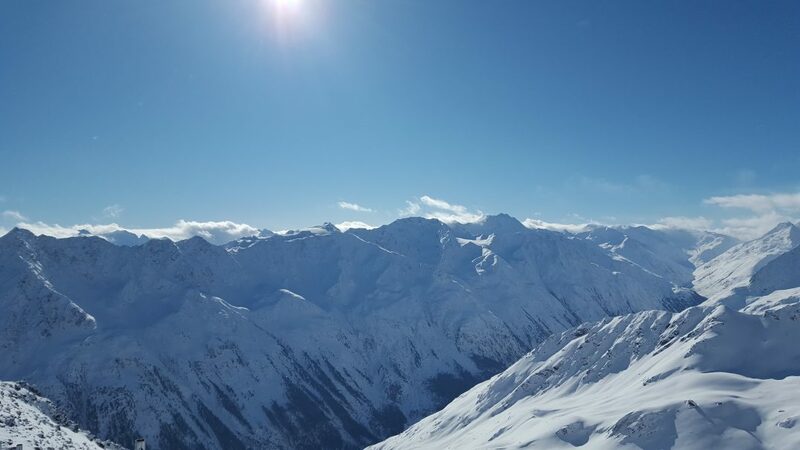 This includes, of course, the area around you: Sölden and the mountains of Austria. It’s dark and cold , so keep your ski clothes on, and yes, you may enter with your ski boots on your feet. Do you feel lost inside the mountain? 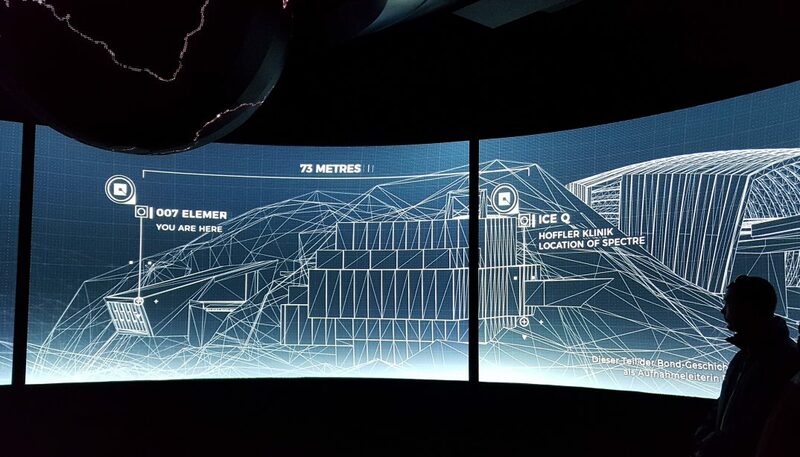 Here is an overview of the layout of the installation, the gondola and the ice Q restaurant. Speaking of which: the restaurant’s architecture was the inspiration for the “Hoffler Klink”, where Bond meets Dr. Madeleine Swann (Léa Seydoux) for the first time in Spectre. But before you enjoy the excellent food at the ice Q, (make a reservation, it can get crowded! 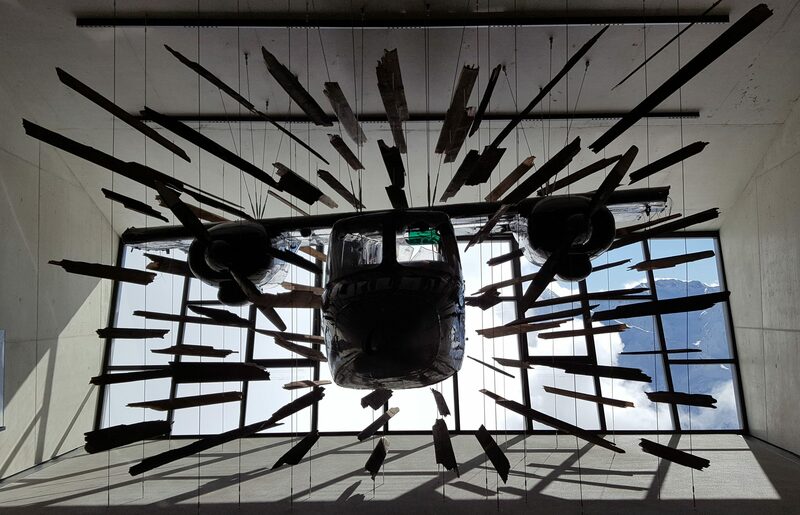 ), there is much more to see and experience inside “007 Elements”. And you are part of it. A “scan” of your arm is the entrance ticket to the world of spies. 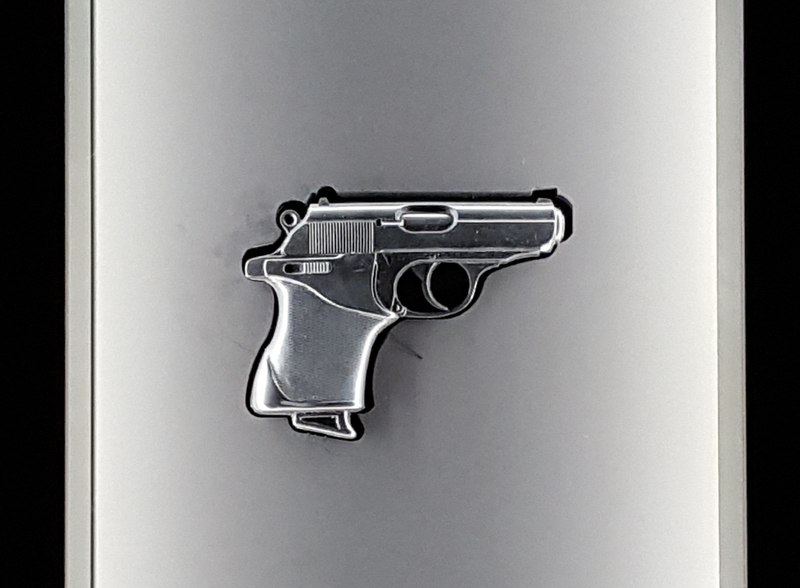 You get your own number (mine: 6067) and history: Apparently, I survived 16 bullet wounds, 24 amorous liaisons, and132 high speed pursuits, disabled 28 explosive devices, and completed 32 missions. 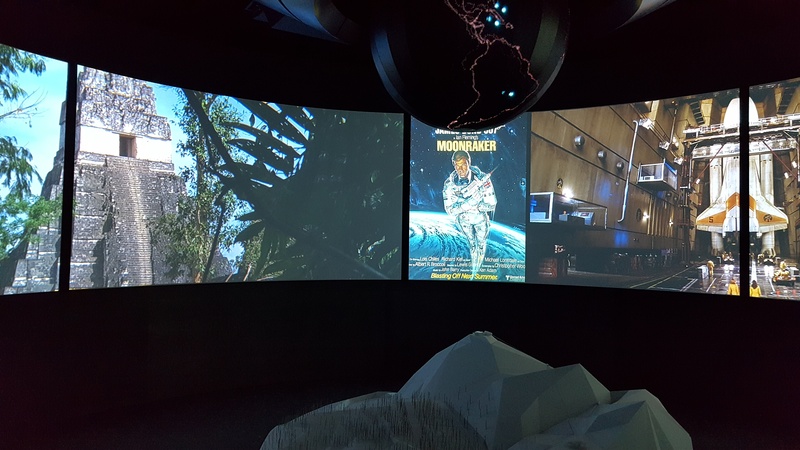 All this, the guns and gadgets, the technical equipment behind the scenes, is presented in the most futuristic manner – worthy of a Bond “museum”. More than once, you change the view of an exhibit with the movement of your arm. 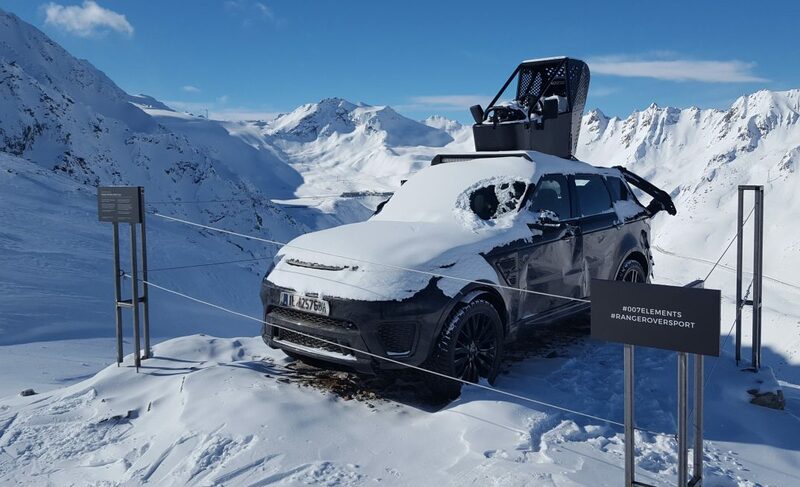 If you pay attention skiing down, you can see at least two of the cars used in Spectre on your way downhill (hint: they are on opposite sides of the mountain, so you would have to go down twice). Ever experienced a blizzard in a historic mining town? If you are lucky, you are on the right side of town, and have enough cash to last you through a few days. 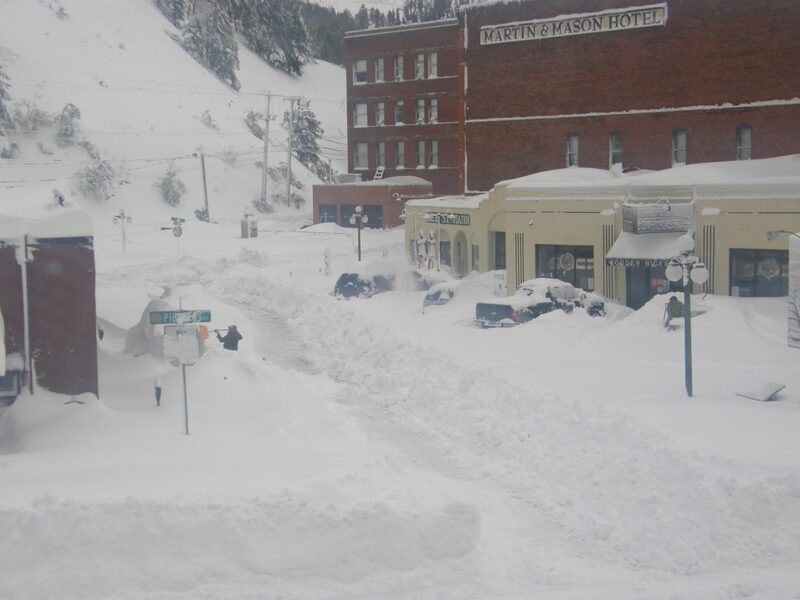 The historic blizzard of October, 2013, dumped dozens of inches of snow onto the Black Hills region in South Dakota. From October 3 – 5, much of the area was paralyzed. I was in the middle of it, in Deadwood, the historic mining town. It started to snow heavily on the evening of the 3rd, and didn’t stop for over a day. Since the trees still had leaves, the heavy snow made them fold as if they were made of paper, taking power lines with them. Half of the town lost power. People had to be evacuated from one of the big hotels, which had no heat and no lights. Getting food was a challenge. Most of the restaurants and shops were closed. 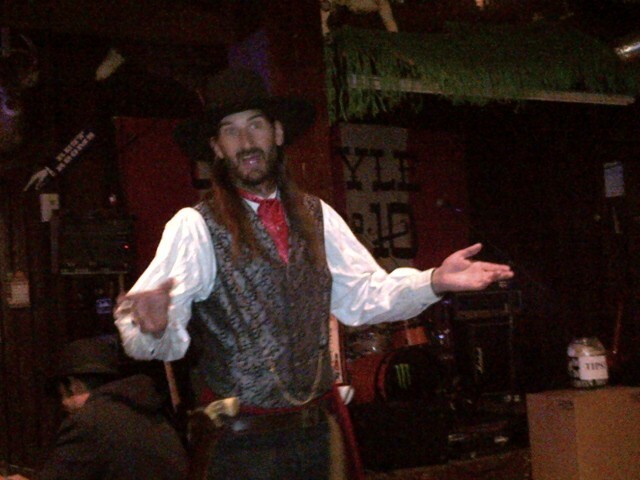 The saloon, however, still provided food, drinks, and entertainment, just like in the old days, I guess. The next day, most of the shops and restaurants were still closed, there was no way of getting out of town. My car was in a garage, so I didn’t have to worry about it. But then, in the evening, all credit card machines stopped working. 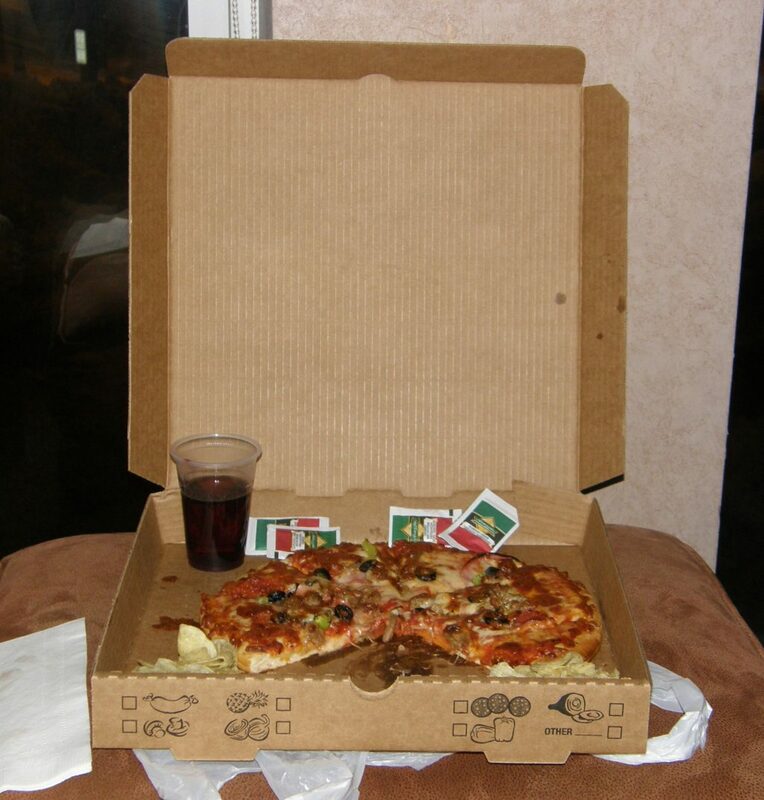 For the few dollars I had left in cash, I got a pizza and wine. All I could do was be patient, cuddle up in my hotel room which thankfully still had heat and electricity, and wait. On the third day, people started to slowly dig themselves out. I took a walk around town and into the hills. People were anxious and stressed out, they had not been able to leave their homes for 48 hours, had no electricity or phones and over a meter of snow in their driveway. I made a phone call for a lady who wanted to know whether her relatives were okay and ask them for help. The roads out of town, however, were still closed. I was supposed to fly home the next day. Well, that was not going to happen. 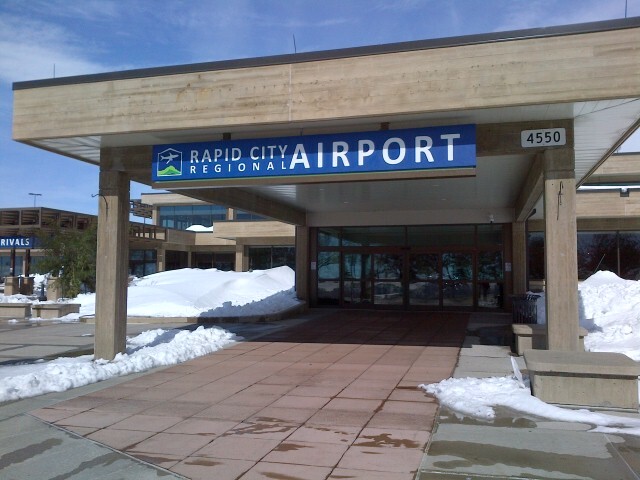 On October 6th, with a rental car with summer tires, I dared to take the road that would get me to Rapid City. It was a bit scary at first, but I made it. The airport, however, was still closed. It would take two more days, until I was able to head home. Before heading home, though, I managed to visit the fifth state on my trip. I mean, I was grounded anyway, but the big roads were clear, so why not take another trip. In Wyoming, the plan was to visit Devils Tower National Monument. Guess what? 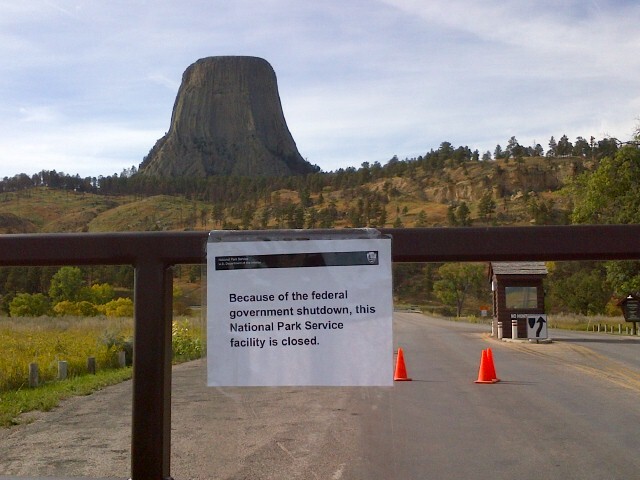 It was closed because of a government shutdown. Sound familiar? Well, I like traveling in the US, because you never know what jewel you will encounter along the way. 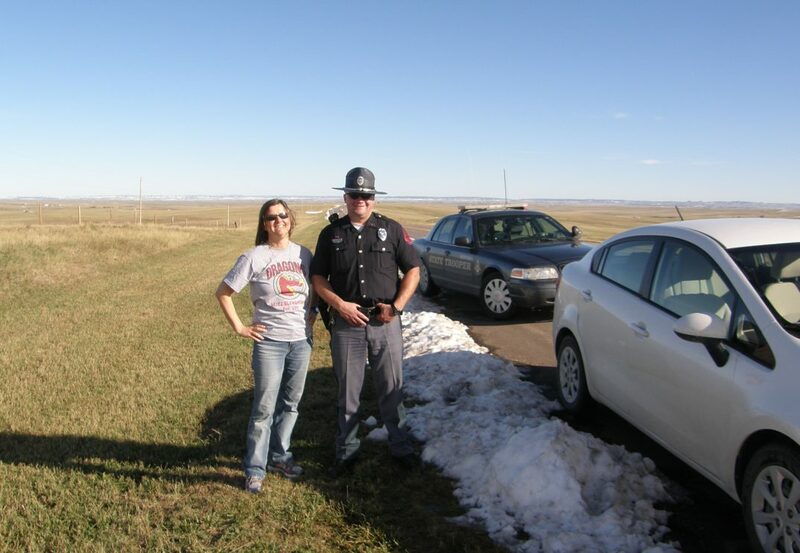 In Baker, Montana, I just wanted to take a quick break and stretch my legs. 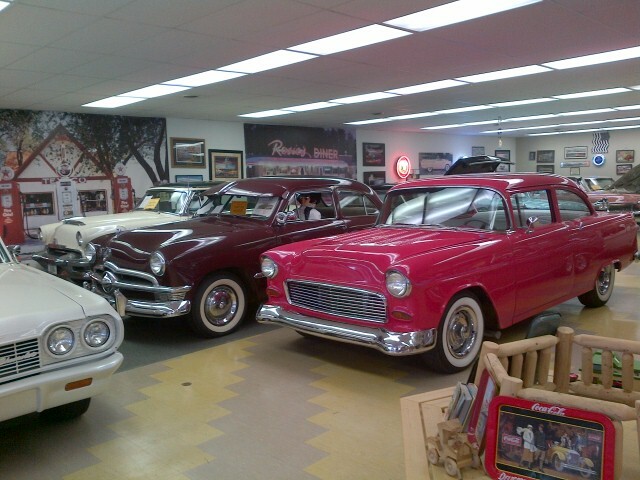 And walked right into Prairie Rose Classics, an antique and classic car sales store, that takes you back to another era. They not only exhibit cars, but hundreds of everyday items from the last century. It’s like a museum. So after the blizzards, and while waiting for the airport to open, I decided to take another trip to South Dakota’s southern neighbor, Nebraska. 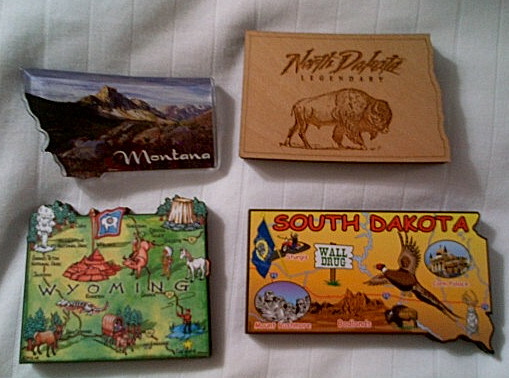 It was only a quick trip, and I had to buy a deck of cards with the state’s name on the back, because I could not get a magnet. As I said, I didn’t drive far, but still managed to make this a trip I will never forget. I have one tip for you: Even on an empty road in Nebraska, stay within the speed limit. And if you don’t, at least buckle up. It might make the difference between a ticket and a warning. Trust me. I know.